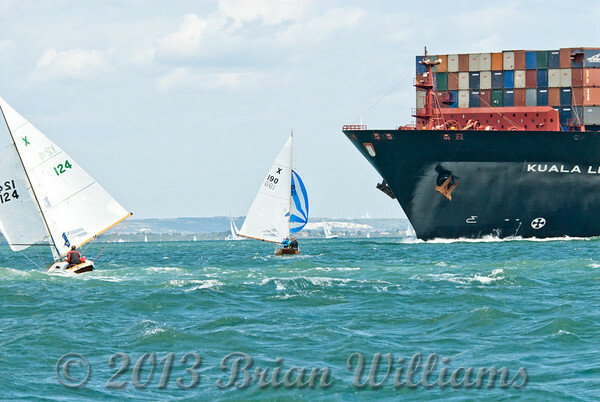 Conflict of interests; close encounters of the large kind; Cowes Week 2013 day 8, part of the XOD course is from east bay (3Q) to west knoll (3Y). The Kuala Lumpur Express is in the shipping lane on route to Southampton Docks at some point there paths will cross. The Kuala Lumpur Express is 336m long with a 42m beam and a 93,811 gross tonnage this container ship is slightly larger than the 6.31m long with a 1.80m beam of a XOD one design. On this occasion sail does give way to power? The Kuala Lumpur Express is 336m long with a 42m beam and a 93,811 gross tonnage this container ship is slightly larger than the 6.31m long with a 1.80m beam of a XOD one design. On this occasion sail does give way to power?